USC Digital Library Los Angeles Examiner Collection. Inside the Los Angeles Exposition Park exhibition. USC Digital Library Los Angeles Examiner Collection. 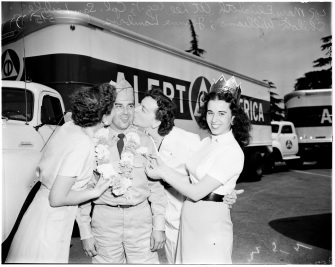 Driver of the lead truck in the Alert America caravan is greeted by Miss Alert America (right) and two hostesses of the exhibition in Los Angeles. The Alert America Convoy was an excellent example of Cold War pageantry related to the overall performativity of Civil Defense. “Civil Defense was a domestic policy, yet sent signals abroad: the Kremlin was the implied spectator of rehearsals and Soviet assessment of efficiency was crucial to deterrence” (Davis). In as much as such events claimed to rally the public toward defense, they were also part of convincing “the enemy” that attempts to break American morale would be unsuccessful. “In keeping with the other Cold War pageants of the era, including the Freedom Train, the Alert America Convoy was, at its core, intended to reinforce American values in the face of “Kremlin aggression” as one piece of promotional material put it” (Geerhart). In each city that the convoy entered, it was accompanied by defense related activities such as parades, military exercises, air raid siren tests, mutual aid exercises, and even mock air raids performed by the Air National Guard (Davis). The Los Angeles edition of the convoy was installed at the Armory at Exposition Park, at Exposition Boulevard and Figueroa Street. Although it targeted major cities for its week-long events, the convoy also stopped in other, smaller cities along the way. As reported in The Van Nuys News, after it left Los Angeles, it made a stop on Van Nuys Boulevard; however, its arrival was unannounced, and its turnout consisted of only "a few chance passersby." Take a look through the slideshow below for news articles and images of the actual exhibits that were on display!